Our dining room has been a very slow work in progress. When we first moved in, there was purple wallpaper on the walls which Jake promptly removed. I wish I had a true before picture, but this was pre-blogging. Here's a picture of the room once the wallpaper was down and the walls were primed. 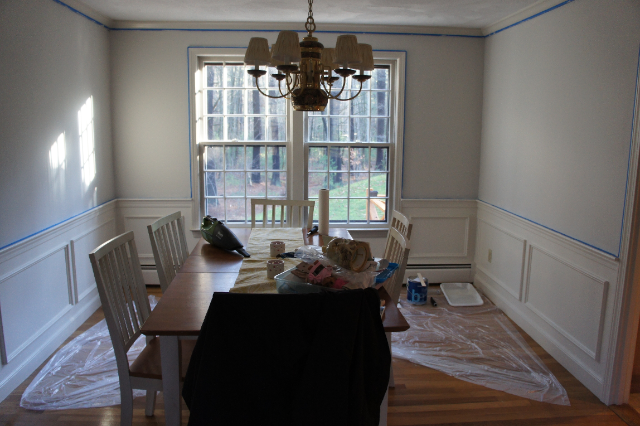 Here's the dining room today (still in progress). 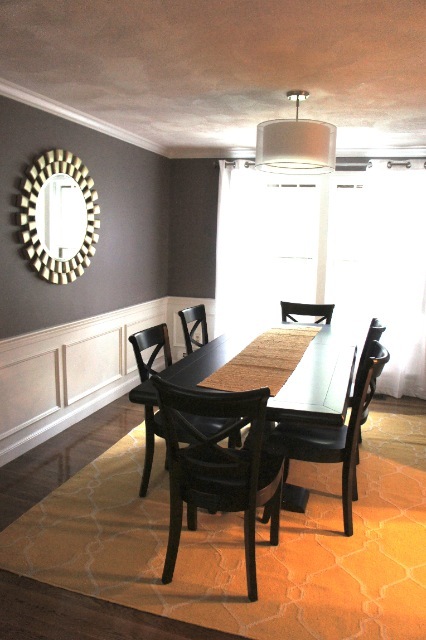 Our newest additions are a dining room table, chairs, and mirror. 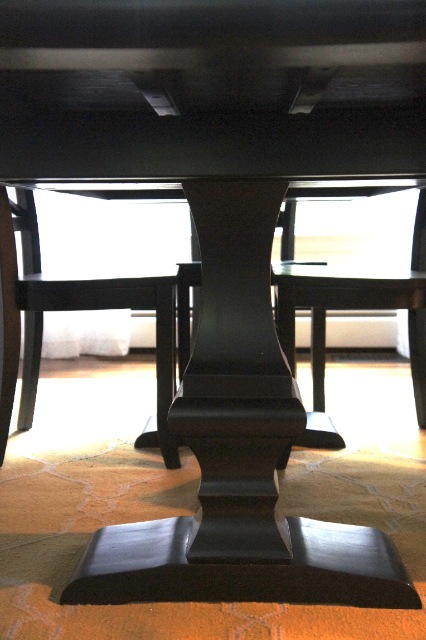 I bought the Chianni Trestle Table from Ballard Designs. I searched high and low for a trestle table that I loved, and this one came in at the right price and had great reviews. I wasn't leaning towards a black table at first, but I really love it. 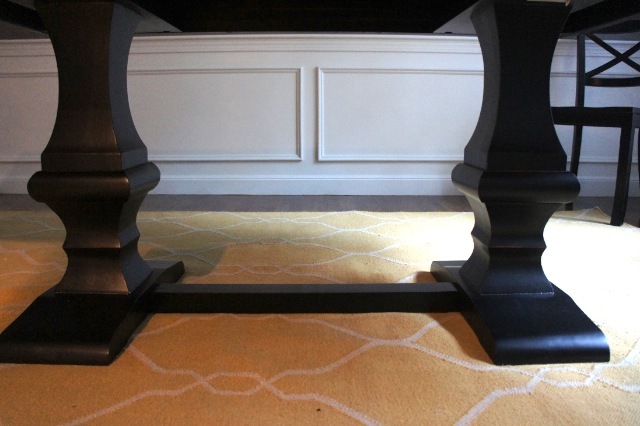 The finish is rubbed black so the edges are slightly worn and you can see wood grain beneath. I bought the chairs from Crate & Barrel. They are the Vinter black side chairs and have the same rubbed black finish as the table so everything matches really well. 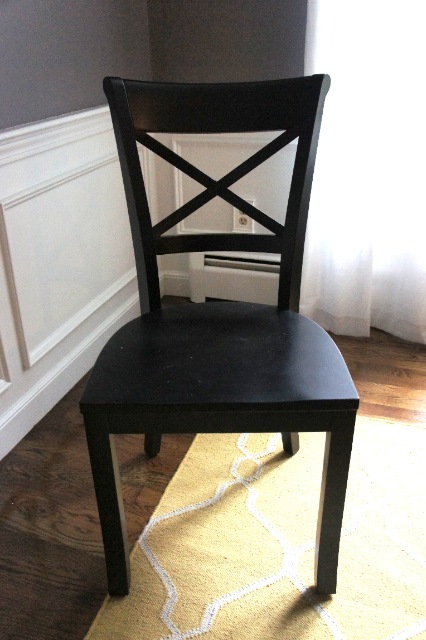 I bought 6 chairs and the table seats 6 to 8, so I'm still on the lookout for 2 end chairs. I want something fabric and light to break up all the black. The last addition is the huge sunburst mirror. 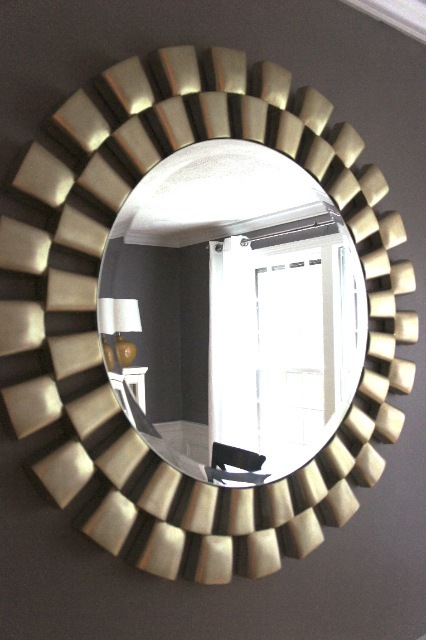 It's the Hera Silver Wall Mirror from Overstock. I wanted a very large mirror to help fill in that big blank wall, and this mirror was one of the more affordable ones that I could find. The finish is more of an antiqued silver instead of a polished silver (as advertised), so in some lighting it has a goldish hue. I actually like how it plays off of the yellow rug. It's not the best quality in the world, but it looks very nice on the wall and I'd recommend it if you're looking for something relatively inexpensive. With these changes, we're *almost* ready to host Thanksgiving dinner. Now I need to learn how to tablescape! I love the paneling and chair rail! Beautiful! I love your table, and the woodwork on the walls is pretty (we put up something similar in our dining room). Looks like your room is really coming together! I love the wall color and rug combination. Can't wait to see what else you do in there! Something tells me you will have NO problem tablescaping... that room is gorgeous! I love the color of your DR walls. I envisioned a gray/navy for my dining room. My hubs envisioned a brighter blue. :) He won. Love the rug, table, mirror - it looks great! Can't wait to see the holiday decor.